You’ll find our flags in some out-of-this-world spots, like aboard the Space Shuttle Endeavor with Commander Mark Kelly. See more. Want to see pulses rise before the race even starts? Fly a custom Battle Flag. See More. Flagmaker. Sailor. Business owner. Bettina’s favorite job? Helping people make their dreams fly. Read more. Be you a sailor, salesman or celebrant, The Sailbag Lady can make you a custom flag or banner both meaningful and memorable. Read More. 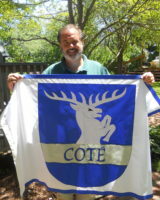 For almost 35 years, Bettina Braisted and her merry band of seamstresses have been handcrafting high-quality custom banners, burgees, flags or pennants that are creative, unique and, more often than not, a lot of fun. She takes great pleasure in the collaborative process, working with people to turn their ideas into durable displays that project the customer’s vision with impact and style. Explore our site, gain some inspiration and then let us know what we can create together.